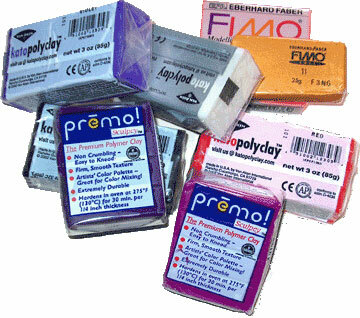 Now available from a variety of manufacturers, polymer clay is a widely recognized modeling material that can be used by children and professional artists and everyone in between. Commercially used polymer clays were first developed to address wartime shortages of materials used in doll making. Bakelite, an earlier form of plastic used in jewelry, buttons and many industrial and consumer items, had been in use for half a century, but it was a phenol based product. Bakelite was a HUGE hit with designers of all sorts–everything from radios and clocks and parts and knobs for cars, to jewelry, purses and buttons. They even had kits for home use but these were a bit problematic–much care had to be taken with it, as it was quite flammable during the production process. The polymer clays we know today are chemically different, no longer made with a phenol base, nonflammable, and are much safer for home use. Some clays come with inclusions such as mica or glitter. Some are in liquid form. While it comes in many inter-mixable colors, clay can also be tinted/colored with pigments and additives. The possibilities in design are endless!! Strength of the final product is dependent on proper conditioning of the clay, complete curing, and brand. In my tests, Kato Polyclay is the strongest clay. I don’t use anything else for dolls and miniatures, but the other clays have their uses too.